Survivor: Vanuatu (2004) - 5th place, 14th out - 5th juror. Voted out in Episode 13, "Eruptions of Volcanic Magnitude" (Day 36). Vanuatu Ep. 2 IC: "Four on the Floor" - Tethered to Mia; thanks to Scout's forgetting a piece, Yasur loses. Vanuatu Ep. 4 RC: "Remembrance" - Makes Yasur's third match, Yasur wins (Dah!). Vanuatu Ep. 5 IC: "Outwit, Outplay, Outrig" - Retrieves the paddles with Chad, Lopevi wins again. Vanuatu Ep. 6 RC: "Pig Pen" - Operates the gate, Lopevi wins again. Vanuatu Ep. 6 IC: "Strung Out" - Moves the float well enough for yet another New Lopevi win. Vanuatu Ep. 7 RC: "Jo Coconut" - Competes, and somehow, Lopevi loses. Vanuatu Ep. 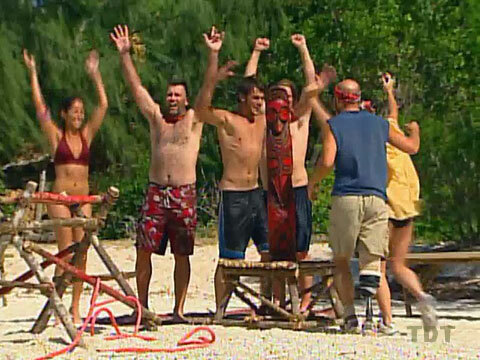 8 RC: "Fire Fighter" - One last new Lopevi win in the final tribal challenge. Vanuatu Ep. 10 RC: "Sacrificial Lamb" - Sacrificial lamb for the losing team, with Scout, Twila, and Leann. Vanuatu Ep. 8 IC: "Jumper" - With Leann, a distant 4th/5th in the first heat (bottom 3/10). Vanuatu Ep. 9 RC: "Head Hunter" - Targets Chad and Scout, but 5th person eliminated (5th/9). Vanuatu Ep. 10 IC: "Get A Grip" - No elapsed time shown, but first to drop out (8th/8). Vanuatu Ep. 11 RC: "Played Out" - Reaches final tie-breaker vs. Eliza, whiffs on final question (2nd/7). Vanuatu Ep. 11 IC: "Love Is Blind" - with Justin, fourth to start the puzzle , doesn't win (4th/7). Vanuatu Ep. 12 RC: "Bridge Over Troubled Water" - Finishes just behind Chris, barely missing out on the reward trip (4th/6). Vanuatu Ep. 12 IC: "Island Hopping" - While briefly in the lead, does not win (tie-2nd/6). Vanuatu Ep. 13 RC: "Redemption" - Reaches the final round, and Julie wins! (1st/5). Vanuatu Ep. 13 IC: "Warrior" - Does not win, losing to Eliza (2nd/5). Vanuatu, Ep. 9: One vote, from Chad. Vanuatu, Ep. 13: Three votes, from Chris, Twila, and Scout (voted out, 3-2). Glad for the chance to talk strategy with Leann. Also: wings. Angel Cohn at TVGuideOnline (12/14/04): "Survivor Flasher Flunks Out"
David Bloomberg at RealityNewsOnline (1/24/05): "'He Played Me': An Interview With Survivor: Vanuatu's Julie"
NiceGuy286 at RealityShack.com (circa 2005? ): "Interview with Julie Berry of Survivor: Vanuatu"
"Julie Berry was born in Lewiston, Maine. She was adopted and separated from her only biological sibling when she was 5 years old. She grew up in Gorham, Maine, with a very intellectually stimulating and expansive family who encouraged individuality and creativity. Her parents, Judy and Les, have been happily married for more than 30 years. Her brother, Chris, recently celebrated his one-year anniversary with his wife, Kate, and has just passed the bar exam. Berry describes herself as restless, playful and reflective. Traveling has become her ultimate experience. Currently single, she resides in Gorham, Maine. Her birth date is December 15, 1980."